When I need something easy to read, with characters I like, and that will make me laugh, I turn to Janet Evanovich. The latest book in her Stephanie Plum, Bounty Hunter series lives up to expectations – Explosive Eighteen (following on from Smokin’ Seventeen) is laugh-out-loud funny, has some completely crazy characters, and manages to contain a mystery that had me guessing to the end. Stephanie, back from a holiday in Hawaii that ended abruptly and that she refuses to speak about, finds herself the target of some shady folks who are after a photograph she threw away – and that belonged to her seatmate on the flight back from Hawaii, who later turned up dead. Alongside “former ho” Lula, Stephanie’s also trying to make some money by picking up people who have failed to make their court dates, including arch-enemy Joyce Barnhardt. And, of course, she’ll still caught in the middle of the two men in her life – Morelli and Ranger. The pair take a bit of a back seat in Explosive Eighteen, which is fine with me. I like the two of them, but I like reading about Stephanie and her gang of misfit friends and family more. Lula, in particular, was a highlight in this book, as she fell in love, while Stephanie’s Grandma Mazur is hilarious and terrifying in equal measure. 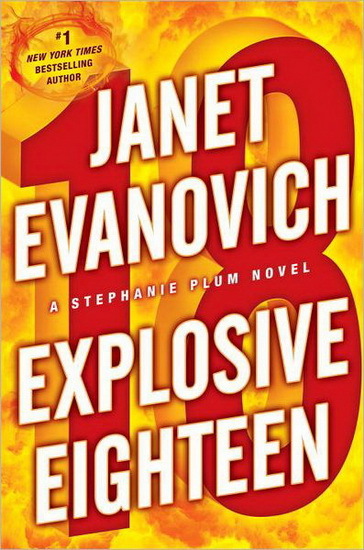 I’m currently working my through a giant non-fiction tome, so Explosive Eighteen was a fun break from that book. It might not have taught me anything new, but Explosive Eighteen did something more important – it made me laugh.